Sandra's three therapy horses, Henry, Winnie and Flora, were raised and trained in her yard. By breed, they are Irish Cobs - a breed which is mostly known for their 'hairiness' and their generous and patient yet intelligent nature. They are very friendly and sociable horses, who enjoy the contact with us humans, and who are excellent at tuning into the slow and steady mode of a Therapeutic Riding session. They have strong confident personalities and are not easily frightened - ideal partners for having fun with, playing lively games and helping people grow. In many ways, Henry has been a significant contributor to starting up this project. He travelled alongside Sandra on her journey towards starting this project. He has been part of many of the key experiences and key insights with Sandra, which eventually led to 'Hairy Henry' Therapeutic Riding, so it only seemed right to name this project after him. 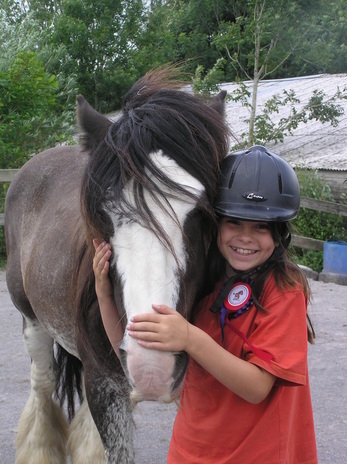 Henry, Winnie and Flora, and many of the other animals at Hairy Henry's, have been able to put a smile on someone's face by simply offering their warmth and softness for a big hug. We can only encourage you to give it a try...it actually works!